With Easter only about a week away it’s high time to start planning a delicious menu for family and friends. Over the next 10 days we’re going to share a number of awesome springtime breakfast, lunch and brunch recipes so you can pick and choose from your favorites to design the perfect meal for your loved ones. This first recipe for simple sweet muffins is the cornerstone of any good breakfast, brunch, tea party, wedding shower…. you name it! Put your own spin on them by adding cranberries, blueberries, apples, dates, or nuts and serve these hot cakes warm! Top still warm muffins with a slice of butter and serve. 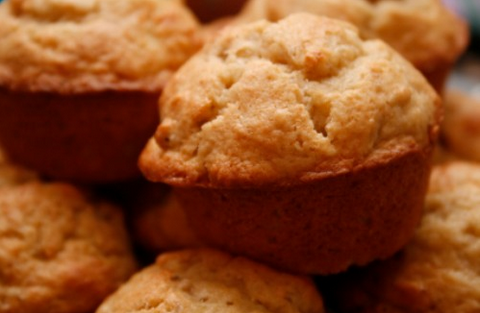 For delicious Apple Muffins add 3/4 cup peeled and chopped apple, 1/2 tsp. ground cinnamon and 1/2 tsp. ground nutmeg during step 5. For irresistible Date-Nut Muffins fold in 1/2 cup chopped dates and 1/2 cup chopped pecans during step 5. Click Here to submit a referral today! This entry was posted in Recipes and tagged Apple Muffins, Date-Nut Muffins, Passanante's Home Food Service, Recipe, Sweet Muffins by Passanante's Home Food Service. Bookmark the permalink.